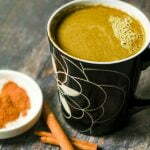 This hot cinnamon buttered matcha has the buttery, cinnamon goodness of a piece of buttered cinnamon toast. Matcha tea has great health benefits and tastes great in this warming low carb drink. Add all ingredients to your high speed blender and blend on high. Note*** Originally I made this with coconut sugar. If you use coconut sugar please use 2 teaspoons or more if you wish. For the low carb version I used Swerve sweetener. See post for nutritional information.